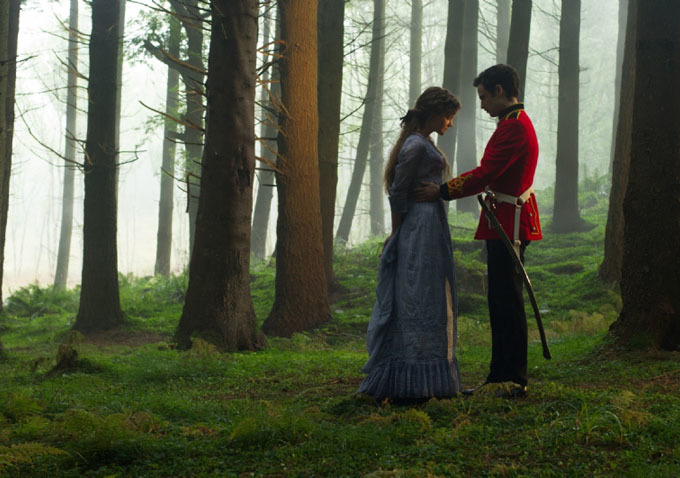 Film Review: ‘Far From the Madding Crowd’! Thomas Hardy’s 1874 novel ‘Far From The Madding Crowd‘ has gone through many interpretations and adaptations throughout the years. Some of them were good. Some were not so good. It’s been long enough to get a new adaptation of this fascinating novel and its characters, which had one of the first instances of feminism and individuality for women. Director Thomas Vinterberg plays it easy on the feminism aspect here, and instead gives us a woman who we cannot clearly get a read on through most of the film. However, it is clear that she doesn’t need a man in her life, because of her education and wit, which she narrates at the start of the film, but never talks to us again. The woman in question is Bathsheba Everdene (Carey Mulligan), who comes into money and land in rural England. Because she is a woman in the 1800s, all the men think she is less than what she really is, but she is there to show them that she can work and play just as hard. She’s never to course, but she can hurt feelings to maintain her thought that she needs no man. Well of course, three men become enthralled with her over the course of this story. One is a man named Gabriel Oak (Matthias Schoenaerts), a sheep farmer with good intentions and a good heart, who quickly asks Bathsheba to marry him. Of course she says no, because it was too quick, but to add insult to injury, she goes as far to say that he couldn’t tame her, although she wouldn’t know what that really means. After an accident forces Gabriel to lose his farm, he ends up working for Bathsheba at her new compound to make it the best and most beautiful land in the area. The second suitor comes in by the name of William Boldwood (Michael Sheen), who is an older and very wealthy aristocrat, who also asks Bathsheba to marry him too soon. She of course rejects him, but wants to keep him as a friend, although she has feelings for him and Oak. Lastly, a strapping young soldier (Tom Sturridge) with a past crosses paths with Bathsheba, takes out his “sword”, dangles it around, and she completely falls for him. The irony and symbolism made me laugh out loud here. Bathsheba got one taste of honey, and she fell head over heels for the wrong man. Hell, she even marries him, where he continues to gamble her money away, while the other two better suitors look on in horror. But hey, Bathsheba doesn’t need a man. That was the one frustrating thing about this certain adaptation, which does stray from the original story quite a bit. We just never seem to know why Bathsheba holds the views, and why she makes the wrong decisions, where she seems highly intelligent, which would prevent her from doing the wrong thing. At least with this adaptation, we go receive an answer to the three suitors, which should satisfy most audiences. Mulligan does a fantastic job as Bathsheba. Even though you want shake her sometimes, she plays Bathsheba with grace and a certain charm that keeps you coming back for more. No wonder, all these men wanted to be by her side. And all three suitors turn in impressive work as well. Vintergerg’s camerawork is beautiful and captures the beautiful landscapes and time period very well. ‘Far From the Madding Crowd‘ is a slow burn, but it ultimately is a satisfying adaptation of this literary masterpiece. This entry was posted on Thursday, May 7th, 2015 at 3:34 pm	and is filed under Film, News. You can follow any responses to this entry through the RSS 2.0 feed. You can skip to the end and leave a response. Pinging is currently not allowed. « Film Review: ‘Hot Pursuit’!